Artists and photographers have long created iris portraits: many of us are familiar with the famous iris paintings by Georgia O'Keefe. Endless combinations of line, form and color can be produced by zooming in on the iris flower. Irises are so photogenic in this respect that the temptation is to take nothing but portraits and close-ups: the striking beauty of the iris flower causes us to neglect photographing the whole plant. There are other challenges for the amateur photographer who wishes to capture the plant in the landscape. Aside from focus and exposure issues, there is always the blue tarp covering the compost pile, the rusting skeleton of an old Bultaco, or more often, three-foot-high weeds looming in the background. Here I tried to give you some photos of the plant, foliage and all, as well as the flower. It would be a little dull were I to take these photos today, since so few irises are in bloom, so most are from last spring. Many of these irises are new to my garden and have yet to form true clumps. This gives me something to look forward to next year, and this spring, I promise to take photos of the whole clump, even if the weeds are blocking the view! Tall Bearded Iris 'Rare Treat' in Andi's garden. Ruffles galore. Tall Bearded Iris 'Lady Friend' which is the first to bloom for me. 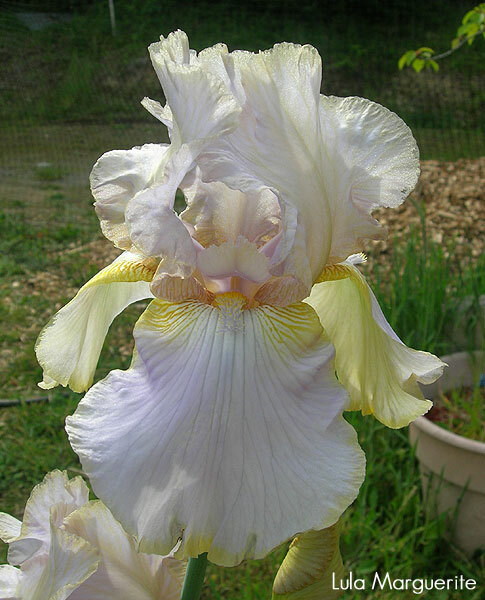 Tall Bearded Iris 'Cajun Rhythm,' a late bloomer. Tall Bearded Iris 'Persian Berry' a very early bloomer. 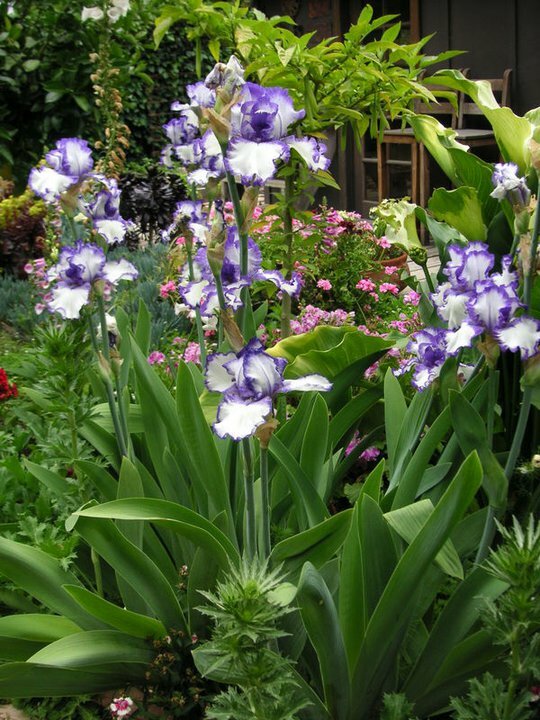 Tall Bearded Iris 'Spin Off' is good for the front of a border. Border Bearded Iris 'Maid of Orange' has nice, upright foliage with narrow leaves. Tall Bearded Iris 'Scoonchee' in Lois's garden. Tall Bearded Iris 'Queen's Circle' in my garden (top two) and at Carolyn's. Tall Bearded Iris 'Sweet Musette' in Wendy's garden. I leave you with this image of a strikingly beautiful garden featuring the iris 'Sweet Musette.' In the background, tomato cages and wheelbarrows. I have traveled all over the U. S. doing seminars and judge's training sessions. Many of these were on spuria irises. 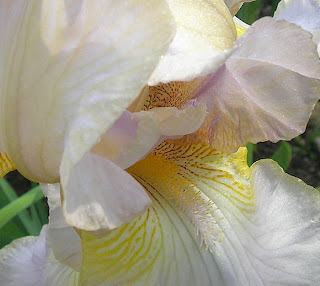 I have been hybridizing tall bearded irises for over 30 years and spurias for 15 or more. When I look at where tall bearded irises have progressed to in 30 years, I all I can say is "WOW." When I look at spurias, I see improvements, but the WOW factor just isn't there. Neurotic (Hedgecock 2011) Is this a new color break in Spuria irises? As hybridizers of spurias, we need to develop some goals in our programs. It is absolutely okay to just make crosses and see what happens, but what are you hoping to get from that cross? I hope many of you will answer better form, better substance, and certainly new colors and patterns. I often ask spuria people that know more than a little about these irises, "Do you think there are patterns that can be exploited in spuria irises?" My most common reply is, " I don't know of any." I know of one hybridizer that wants to produce a line of spurias without signals. I see this as a very doable goal, especially since I have several dark seedlings that have virtually no signals. Another wants to work in the miniature spuria field. The important thing is to pick an area you think you like and get started. Look for spurias that have some of the traits you are looking for in your finished product and start hybridizing. 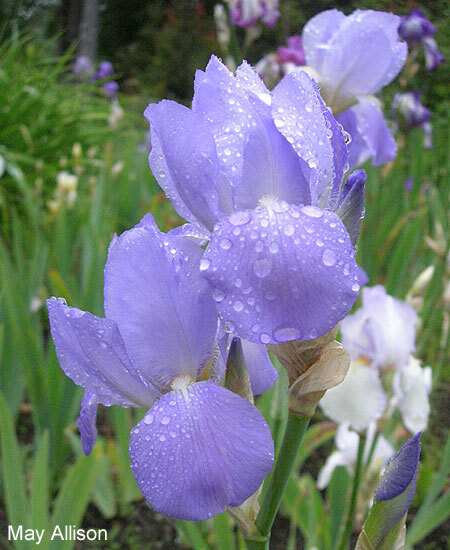 Are there patterns in spuria irises? Undoubtedly there are, but they haven't been established at this time. One area that I find most interesting is the signals on the falls. One question that always come up is, "Are there color bands on the falls or do the signal patches simply expand to nearly the fall edges?" My opinion is that there are definite bands of color that are separate from the expanded signals colors. This is quite apparent in some varieties. This is a possible pattern that could show much promise in future breeding efforts. When I started crossing spurias, I noticed that there were some varieties that had dark solid standards and falls with a large signal patch and edges of the same color as the standards. I borrowed a term from tall bearded irises and started calling these dark tops. I made some crosses with these as a possible pattern and the results were, at least some of the seedlings came in this pattern in varying colors. I believe this is a pattern that can be exploited. We only have approximately 750 spuria cultivars to work with and a number of these are no longer in commerce. Using promising seedlings in your program is so very important. If you think you see something that makes your seedling different, by all means use it in your crosses. I want to hear from anyone about your spuria seedlings and what you are doing in your hybridizing efforts. Together, we can make one of the world's greatest irises a house hold name. God Bless you and your gardens. 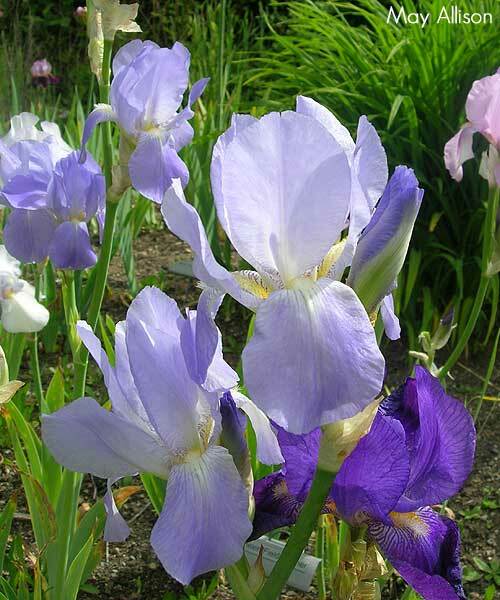 'Lula Marguerite' is a tall iris, easily approaching four feet, raising its large, ruffled blooms on sturdy stems. A hardy variety, its growth is vigorous and its flowers plentiful. It is a creation of master hybridizer Fred DeForest, who began his illustrious career in 1929 and became one of the top hybridizers of the 20th century. He introduced numerous varieties from his Irisnoll garden in Oregon, but is likely best remembered for his reds, such as 'Argus Pheasant' which went on to win the Dykes Memorial Medal in 1952. This beautiful flower was first introduced in 1956, tho it was not registered until 1959 - the same year it won an Honorable Mention from AIS judges. Its parentage is not listed. Different and unusual! Light blended blue tones with gilt edge on both standards and falls. The gilt edge spreads out over the throat of the flower, giving a glittering effect to the whole flower. Large, beautifully formed, ruffled flowers. This brief description fails to mention the faint flush of orchid at the heart and the heavy diamond dusting across the entire bloom. It lights up with all the soft colors of a spring sunset. Please click on the photos for a larger and more detailed view of its delicate coloration. 'Lula Marguerite' has all the good qualities one looks for in a garden plant, combining both beauty and performance. 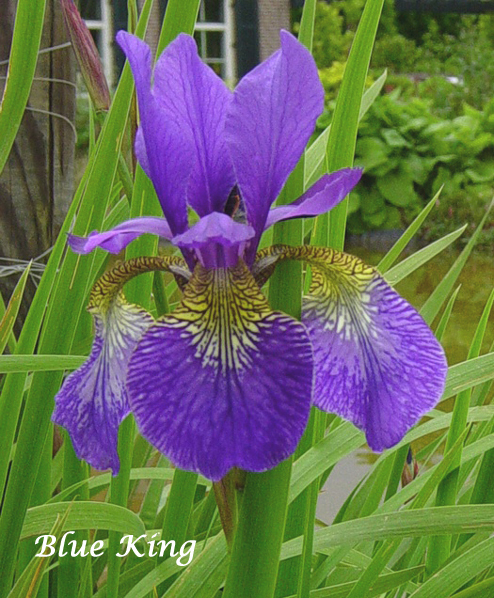 Its intricate coloration never fails to please visitors when they come across it - another iris variety that is truly a classic. UPDATE: Keith Keppel writes to tell me he knows the parentage of 'Lula Marguerite': (Spanish Peaks X Chivalry) X Cloudcap. Mr. DeForest used Cloudcap extensively in his hybridizing. He also says that it is named for Fred's mother. Good to know! Thanks, Keith. 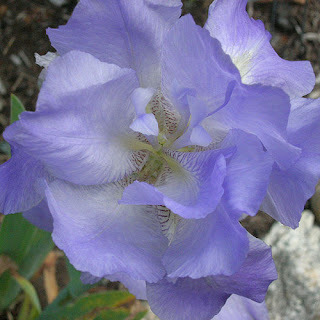 A fascinating must-read, must-see article on the last issue of IRISES, the Bulletin of The American Iris Society on some lovely members of the Iridaceae family: the peacock flowers. “The Other Irids: The Peacock Flowers,” explores Michael Mace’s fascination with these South African beauties now making a stance in the U.S. Michael says that he’s had a love affair with South African bulbs for the last 20 years. He says, “Most of the Moraea species have pleasant flowers in shades of blue and yellow, but the “Peacocks” stand out for their bold colors.” Indeed, the colors are impressive: magenta, purple, and orange. I would say that they one I was most impressed me was a light blue one with green, yes green, yellow and aqua-blue signals. 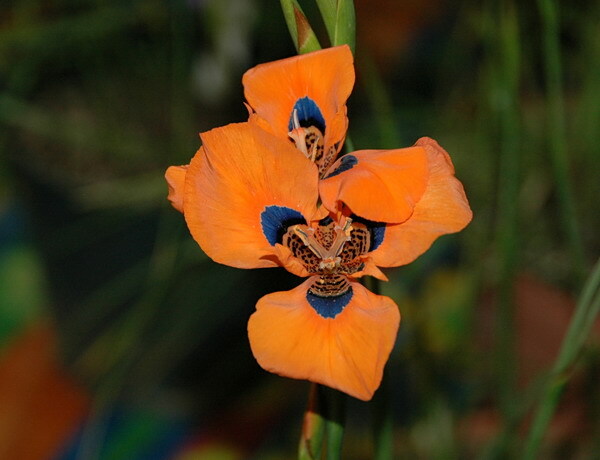 The article is very descriptive and you can read about the genus Moraea’s origins, growing conditions and even commercial sources. Lucky for us Mr. Mace is also hybridizing Peacock Moraea species with lots of exciting results, and he recounts that he made over one hundred crosses just last winter. “The Other Irids: The Peacock Flowers,” is in the current edition of IRISES, October 2011. Michael Mace is a bulb collector from San Jose, California. Iris graminea, a small spuria iris species is an easy to grow jewel. It has two inch flowers on four inch stems. It is easy to dismiss at it flowers below the foliage, but you would be wrong to do so. When picked they can be best appreciated. The tiny flowers show their rich purple, blue, and white colors like fine stained glass ornaments. A bouquet of just a few in a small vase is a thing of beauty. But now as you view them up close there is a very pleasant surprise. They have a scent like the most luscious ripe plums. I think Iris graminea has the very finest scent of any iris. Growing this iris could not be any easier. It needs only a half day of sun to perform well. Ordinary garden soil and drought tolerant but it grows best with average water in a flower bed. I prefer to plant them atop a short stone wall to better see the flowers and they are a little bit closer to my nose as well. 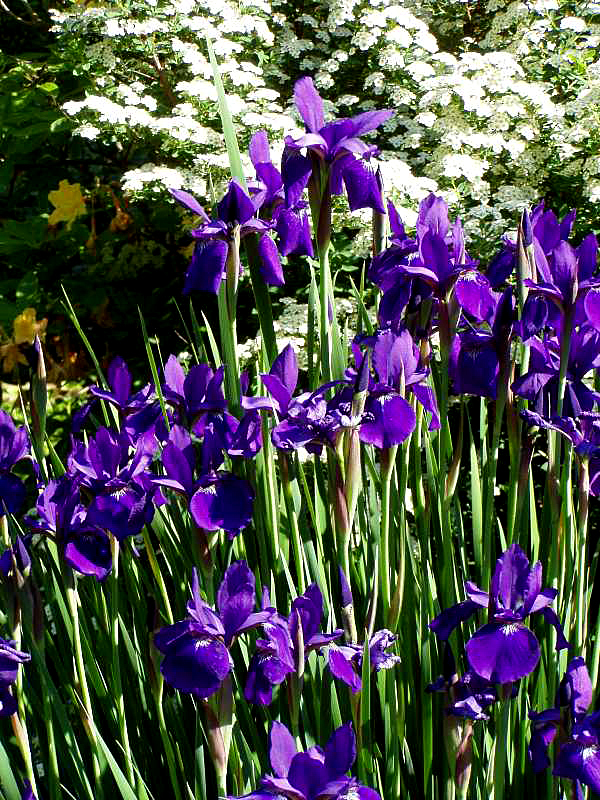 Iris hybridizers and growers are both on the look out for that 'little something extra' in a variety that is really going to make it a standout in the garden. 'May Allison' sure fits the bill - literally! 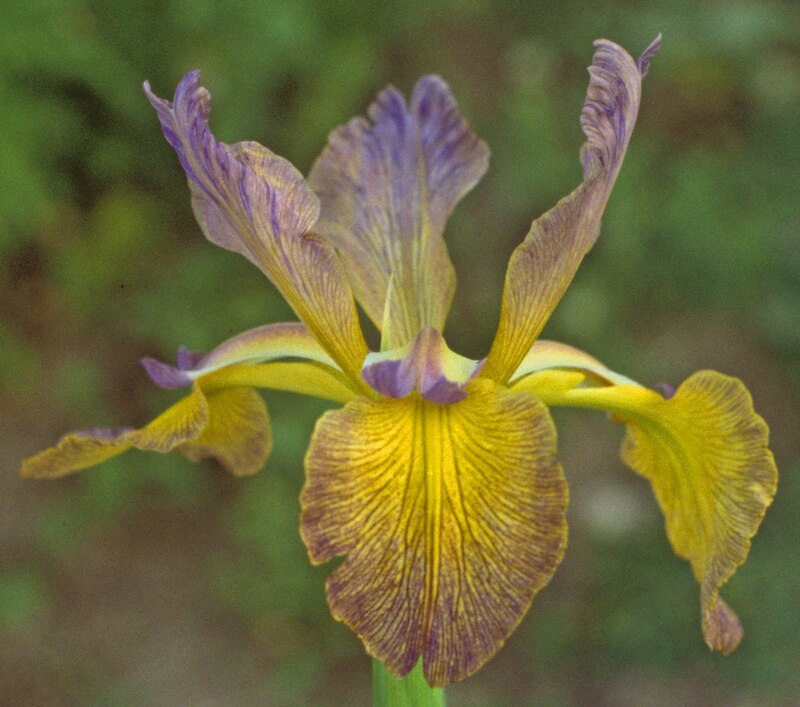 This marvelous little diploid iris was registered in 1930 by Mrs. Mary Allison, an amateur gardener and iris fancier from Raleigh, North Carolina. I can just imagine Mrs. Allison's delight when, while looking over her clump of Monsieur Lemon's classic from 1858 'Celeste', she first noticed the odd little blooms - blooms with six standards instead of the normal three. I suspect she soon noticed that every flower on the stalk showed this amazing trait as well, and, as a true gardener would, she separated this rhizome out to watch it. Another season or two would be all it would take to confirm that rarest of happenings in the iris world - a true vegetative sport. And a decidedly different one at that! However it happened, Mrs. Allison did notice that the style arms had been replaced with extra standards, giving a lovely full effect to the flower, and not detracting at all. And she had the foresight to register with the AIS and have it commercially introduced. 'May Allison', like it's parent 'Celeste', is a small diploid variety, with lots of flowers in a shade of soft lavender-blue. While 'Celeste' is not often seen anymore, "May Allison" is still found in many collections of historic irises. It stands about 2 feet tall, is quite hardy and vigorous, and blooms early and reliably in my garden year after year. 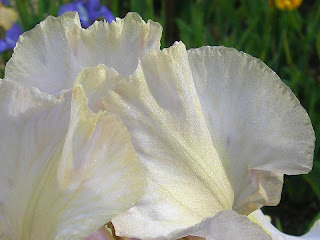 It is one of the most beautiful of the pre-1900 varieties I grow. The editor kindly gave me space in Bulletin No. 103 to ask if there are others who have double iris. The only answers I received referred me to May Allison. In the novelty which appeared in my yard the stamens were sacrificed and replaced with three normal standards. I have succeeded in raising one seedling from this 'Double Standard,' which was single and a different color. - Mrs. Robt. 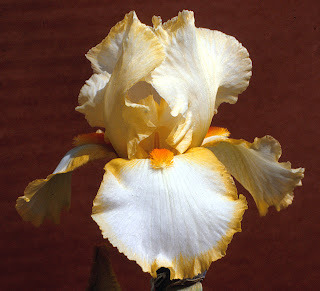 L Motter, Ga.
How she managed to get a seedling from an iris with no stigmatic lip nor pollen producing anthers is beyond me, but given the odd genetics in play perhaps one or the other slipped thru on a bloom or two and allowed a cross. The sharp-eyed and thorough hybridizer often finds things others miss, just as does the sharp-eyed gardener. 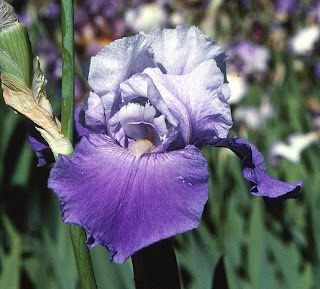 Be sure to watch for sports in your iris beds, and also keep an eye out for 'May Allison' to add to your flower garden. This charming flower is a true iris classic. I rarely am nostalgic for times past and don't long for the return to rural America of the 19th Century, no matter how beautiful and pastoral it may have been. I do like my indoor plumbing, drinkable water from the tap, and central heating. However, as a member of the AIS for over 50 years (I did start, I must point out, as a young teenager and Phil Edinger has the record in Region 14 for AIS membership with 60 years), there are times when I look back at the garden scene years ago and firmly believe it was better than today. 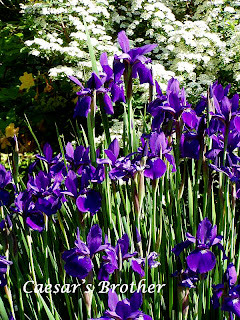 When I started growing irises—or, as I like to say, farming iris—since that is what I did in those days with long rows or plants, the health of irises in Santa Clara Valley, known locally as the Valley of Heart's Delight, was fine—Maynard Knopf, Bernice Roe, Clara and Ruth Rees, and Auda and Hazel Stewart had wonderful plant collections, each year growing the latest introductions. In the case of the Stewart sisters, they also kept up a voluminous correspondence with all the hybridizers of the day. There were even three iris societies—a day group of women that I understand was mainly social, a Campbell area iris society, and The Clara B Rees Iris Society. Though the valley has grown in population from 650,000 to 1,781,642, growth alone does not explain the decline is growing irises here. At that time, the importance of Clara Rees' Snow Flurry as a parent was well known; Bernice Roe was working quietly in her pursuit of green color, though her first introduction Sunset Blues would come from crossing two obvious irises—Whole Cloth and Melodrama; Mary Ellen Knopf had died and Maynard had taken over the breeding lines. Oddly enough, I have much clearer memories of the Rees and Roe garden than the much closer Knopf garden and shortly thereafter Maynard retired and moved to Potter Valley. The Knopfs, too, had been interested in the color green (more on that in another blog)--they did a couple of things that were unique. Seedlings were grown under a double numbering system—one number until they were selected and then a new number after selections. It creates havoc trying to figure out if named varieties are actually sister seedlings since selections form the same cross could have wildly varying numbers. The other interesting marketing approach for the Knopf was to offer to sell their creations a year before introduction with the condition that the plants were not to be sold, traded, or distributed until the year after introduction. Three of the key Knopf irises that were to be used heavily in hybridizing and have a profound impact of the gene pool—Craftsman, Denver Mint, and Launching Pad—were all offered for pre-sale. I have the dubious record of not buying any of them before introduction; it was a good lesson for me in learning not to trust written descriptions. 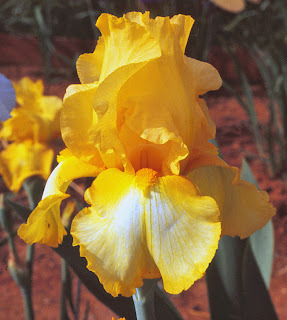 Their fourth important iris, West Coast, came later and West Coast is behind many of the best oranges and yellows of today. But more of these ramblings in the next post about iris California hybridizers going green. My sincere thanks to Janet Smith for converting my slides into digital images. Sometime in the 1920s F. Cleveland Morgan made a controlled cross between two Siberian irises in his Montreal garden. There are two unexpected aspects to this sentence – most people who were interested in new irises in those days just grew Siberian seedlings from bee pods and the pollen parentage is not known; controlled crosses were not the norm. Also, Mr. Morgan was a very busy and important man in Montreal – a director of the family-owned department store chain and a wealthy and very active patron of the arts – so one wonders how he had the time to run an iris breeding program. 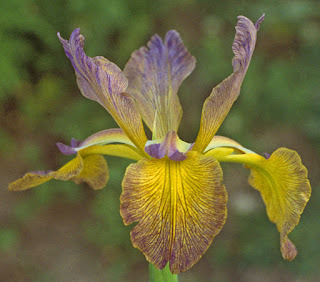 Apparently he had wider iris hybridizing interest than Siberians, but his only three AIS registrations all resulted from this cross: Caesar (1930), Caesar's Brother (1932) and Tropic Night (Caesar x unknown; 1937). In an article in the AIS Bulletin in 1931 he states that he had many thousands of other Siberian seedlings under consideration, but only Tropic Night appeared after this – what happened to the rest I wonder? Other affairs apparently took precedence. The parents of this cross were Blue King and Nigrescens. The first is a mid-blue I sanguinea collected in Japan by Barr in the early 1900s and it is still around today Nigrescens is a bit more mysterious, but it was a dark blue I. sibirica presumably of European origin, attributed to the Belgian horticulturist and plant explorer Louis van Houtte, and has been in commerce since around 1875. It seems to have disappeared from sight now and I couldn’t find a photo of it among our “historic Siberians” slides, but it probably survives in the corner of some garden. Caesar and his brother were initially registered with the spelling "Caezar" and the names were later changed to their current form in 1949. In 1953 Caesar's Brother received the Morgan Award (which precedes the current Morgan-Wood medal and was named after the ubiquitous Mr. Morgan). There are two remarkable things about Caesar’s Brother. Most of its contemporaries from the 1920s and 1930s have by now fallen by the wayside (including its brother, Caesar, which is rarely seen these days). However Caesar’s brother is not only still available but is very common in commercial catalogs – many pages of sources show up in a Google search. I’m guessing there are more references there than for any other individual Siberian. 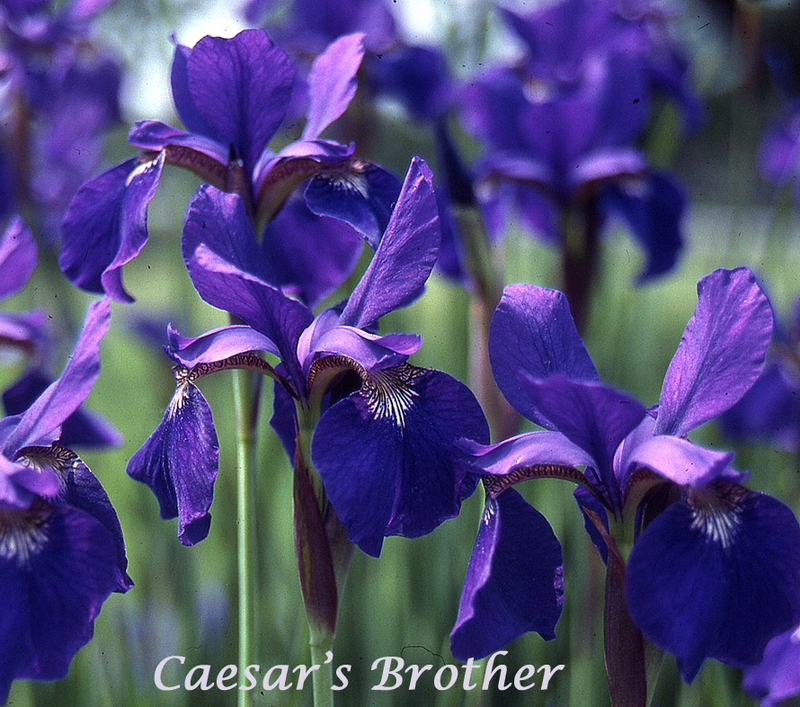 Perhaps this is not unreasonable since Caesar’s Brother is a vigorous and adaptable plant and has very attractive clear deep blue-violet flowers that still epitomize “Siberian iris”. Even more remarkable than its persistence in commerce and in people’s gardens, is its ability to grow and flower well where other Siberians won’t, particularly in warmer regions of the USA. Most Siberians do not tolerate hot weather well, particularly in the spring when damp, cool conditions allow them to develop and bloom at their best. In hotter climates they tend to grow and bloom short, if at all – but not Caesar’s Brother. I have seen strong, tall clumps blooming in southern California, South Carolina, and Texas where other Siberians have given up the struggle. Why is this? Hybrid vigor could be part of the answer to its longevity since it is a primary cross between I. sibirica and I sanguinea, but where does the heat tolerance come from? However it may arise, it is an increasingly valuable property in a warming world. When the city of Chicago is now planning for a climate more like Baton Rouge before the end of this century, we may be seeing the Siberian iris comfort zone heading up to Hudson’s Bay. For someone interested in hybridizing Siberians, the production of warmer-growing versions would be an excellent goal and Caesar’s Brother is an obvious starting point. Now for some questions here at the end. Does anyone have a picture of, or, even better, is still growing Nigrescens? And, if you are reading this in the warmer areas of the US, what Siberians grow and flower well for you? They might like to meet that fine young fellow, Caesar’s Brother.